After buying a new bed at Maypajo early this afternoon, Marilou and I decided to go back for some memory lane trip at the nearby Gagalangin. Now, we got out and lo and behold!, everything is different, there is now a McDonald where some lovely stationery shops were once located. Still we walked confidently following a straight path to Osmena. It was so hot today. Thank goodness for the umbrella Alma insisted we take, at least we had some sort of cover from the punishing sun. We had been walking more than five minutes when our confidence started to ebb. We can’t find Osmena High School. Good thinking Marilou, decided to ask a kind-hearted lady, who said that Osmena HS is located near the market in Bulacan. We asked her where the old one was? She pointed to something near a bridge. My mind must be going as I don’t remember a bridge near our old school. Anyway we went to a building near the bridge but it did not look or feel like the old Osmena. We asked someone again and was told that the old building was over there, pointing to some ambulance trucks. Luckily we met a young man near the ambulance trucks and he pointed to an ongoing huge construction behind him. He said that was the old Osmena, pointing directly to the signage next to it. It sure said that the project is for Osmena High School. He did say that was not true. This building work is for Torres High School. If this is the case, then it is coming in full circle. I was told that Osmena High School was originally created to take in the overflow of students from Torres High School. Marilou and I were a couple of intrepid alumni, no doubt about that. We decided to investigate further and look into the new Osmena High School. We were decidedly surprised to see a well maintained gated building. Lovely potted plants were hanging in corridors. There was even an outside auditorium. A bust of Sergio Osmena prominently displayed in front of the Osmena building. Though we also noted that the girls’ toilet needed renovation, it was still a far cry from the days when we were young students of Osmena. We made do with a building with broken windows. We do not have a gated building with a yard so we did our flag ceremony outside where anyone can see, overlooked by anyone who lived nearby. We marched round and round the street for our Citizen Army Training (CAT). We were the poor relation of Torres High then, that can’t be said now. And yet looking at the rankings of high schools in the Philippines, Torres High School ranks at #88 while Osmena is not in the list of the 220 tops. 🙂 What has happened?!!! Spun sugar used to be made through a labour-intensive process and therefore, the end product was very expensive and only a few can have it. It was in 1897 that a supposed guardian angel of teeth, a dentist, by the name of William Morrison, together with John C Warthon, a confectioner, invented a spun sugar machine to make candy floss readily available to the masses. Their invention known then as a fairy floss was introduced at the 1907 World Fair, making it an instant best-seller. In 1921, another dentist invented a similar machine, which he patented as a cotton candy machine. 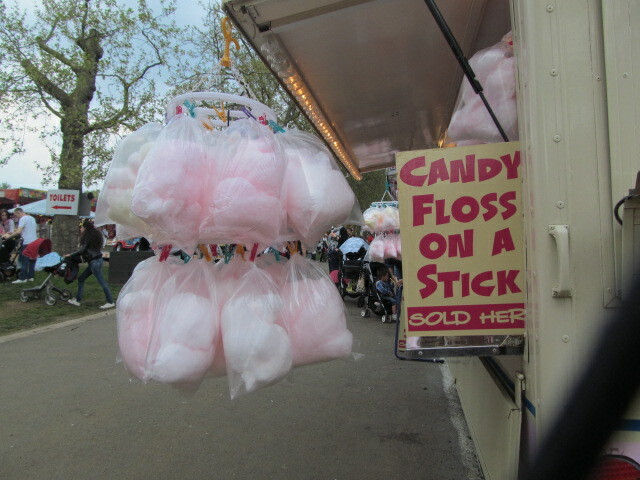 The name stuck whilst fairy floss gradually morphed to cotton candy. When we were young, we always go to church on Sundays. Sometimes we vary the church where we go to attend mass but there were always the same merchandise and treats that await churchgoers after the mass. Aside from cotton candy, there were also popcorn. There was a choice of salty or sweetened and again in pink coloured popcorn. My sister Marilou would get a sweet one and my brother William would get the salty kind. Outside the church were also sellers of birds in cages. I remember begging my parents to get me a bird but they never did. They said it was cruel to keep the maya bird inside the house. It was my birthday last 31st of January. Peter wanted to take me out for the day and I asked him if we could see some dolls. I know! I was feeling rather nostalgic for my fast disappearing childhood. Peter researched about a doll museum and he came up with the Victoria & Albert Museum of Childhood, in Bethnal Green, East London. It was a very good choice too. We were able to indulge in pure nostalgia; a pleasant trip to memory lane. We saw toys, games and other forms of childhood wonderment at the museum. There are also toys from around the world. I saw a couple of toys which are now popular worldwide but originated from my home country, the Philippines. The toys, of course, are the yoyo and the mancala, which we call sunka in Ilocano. There were some exquisite dolls from China, Japan and Persia. Of course, a British toy museum would not be complete without everybody’s seaside entertainment puppetry icon, Punch and Judy. 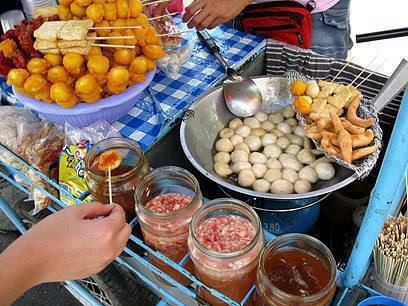 Fish ball or bola-bola is a coming of age staple in the life of every high school student in Tondo, Manila. A fish ball dipped in spiced garlic vinegar or a sticky sweet and sour sauce is so heavenly that memories were made from it. To tell the truth, I don’t remember much what I did in high school but I certainly remember the fish ball, how it tasted, how it was so succulent, how one was never enough but had to make do with just the one as budget was constraint by highschooler’s allowance. Eating a fishball was an absolute feast. You do not eat it hurriedly, instead one has to taste the sour vinegar as you daintily chew on the small fishball on a skewer. With closed eyes, you just let yourself go and feel and savour the many flavours that burst a challenge to your taste buds. It has been so many years, so long ago, and yet I can almost taste fishball now; if I close my eyes I can vividly remember all those recesses and vacant periods lazing around in front of our school where a stall near a stair opposite the old Osmena High School. This stall sold the most delicious fish balls I have ever tasted. I am still trying to find a recipe for fishball bola-bola. I will post it here as soon as I find one. Better yet, if anyone knows of the recipe, please add to the comment box below! I found this recipe in one of my Filipino recipe books. Combine the flaked fish and flour. Gradually add the milk. Just add enough for the fish and flour to turn into a soft dough. Give the dough a good stir to incorporate the seasoning and the parsley. Leave in the fridge for at least an hour for the mixture to harden that it could be made into small balls. Drop the fish balls into a pan of boiling water. Cook for at least 5 minutes. Drain and then quickly fry in some vegetable oil until brown all over. Serve with spiced vinegar or sweet and sour sauce. As autumn grips us further into its depths, the leaves on trees are changing colours into vibrant pink, red, orange, purple, yellow and brown. And then they start to fall. Probably that is why autumn is also called the fall because leaves fall down into the ground. Doh! There were plenty of fallen leaves that had been blown into our front garden that came from the avenue of trees in our street. I was going to try to sweep them up today but the weather turned really nasty. It was so blowy and windy; it was not very pleasant to go out so I thought I should postpone my rather industrious idea of leaves clearing for another day, to a more subdued day – weatherwise. When we went to take our little Diesel for a walk, Peter and I noticed immediately that the front garden was amazingly clear of the leaves and any other debris. It was the wind. It blew the leaves away from our garden, yey. And I was moaning and griping too about the strong wind! huh! Speaking of leaves, I remember that we used to play a game when I was still quite young in the Philippines. It was some sort of leaves snap, a matching game. We would all go gather as many different leaves that we can get in secret and then we would sit around in circle and then try to match each other’s stock of leaves. The one that has the most unmatched leaves wins! You should see the neighbour’s garden, it was like a swarm of ravenous caterpillars had a proper good feast! Have a lovely autumn everyone,wherever you may be! When I was a Secondary (High) School student in the late 1960s and early 70s, my school was a CoE (Church of England). Hymns sung at the end of school term during assembly held each morning before classes, where students and teachers would sing a selection of hymns especially the below as a favourite regular. We sung it quite a few times during my school period, the tune and some of the words became fixed in my memory. Indeed I seem to recall the hymn number in the then version of the hymn book, it was number 736, (near the end of the hymn book). Today when Jean was researching to blog about best-loved hymns in the UK, we searched and found the hymn now numbered 333 in a hymn book and I guess still sung at terms end. Reading the words and hearing the hymn . Ne’er again Thy Spirit grieve. Draw us evermore to thee. Knowledge pure and love unfeigned.